So, I was on holidays and browsing the internet as I was at a bit of a loose end. I was searching for 'vintage + chairs' as I frequently do (as I am chair obsessed). Never mind the fact that I have a set of 8 ready to reupholster in the garage for a revamped dining setting. . . . . 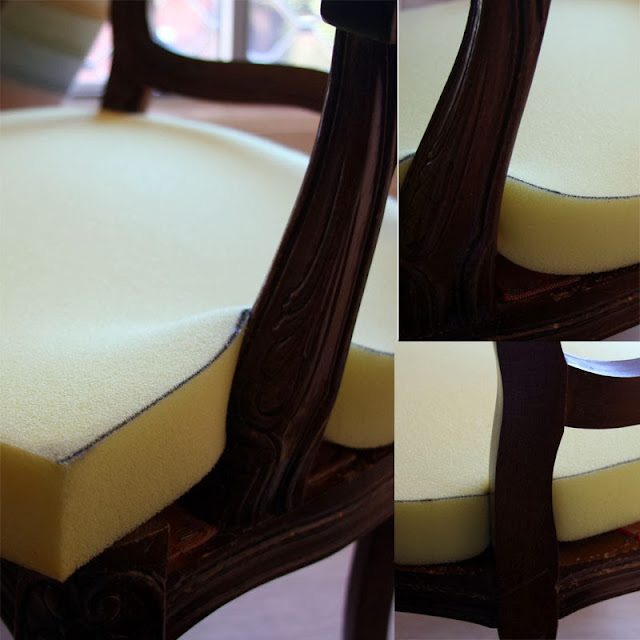 I have been liking the French Louis style for a while and was hoping to go up a level of difficulty with chair upholstery as I have completed a few simple projects. Something to really sink my teeth into. So, I saw it, I liked it and I purchased it. Then, fingers crossed, I drove the 186km to pick the chair up hoping that it would fit in the back of my car. Whoooooooo! It did. It took forever for me to choose what fabric to cover this chair in. I was going to go all colourful and contrasting and paint the frame but couldn't decide on a pattern or colour. To help me decide, I left the chair in the lounge room and pondered it for a few weeks. Fabric.com gave me heaps of ideas as they have a huge array of home furnishing fabric. 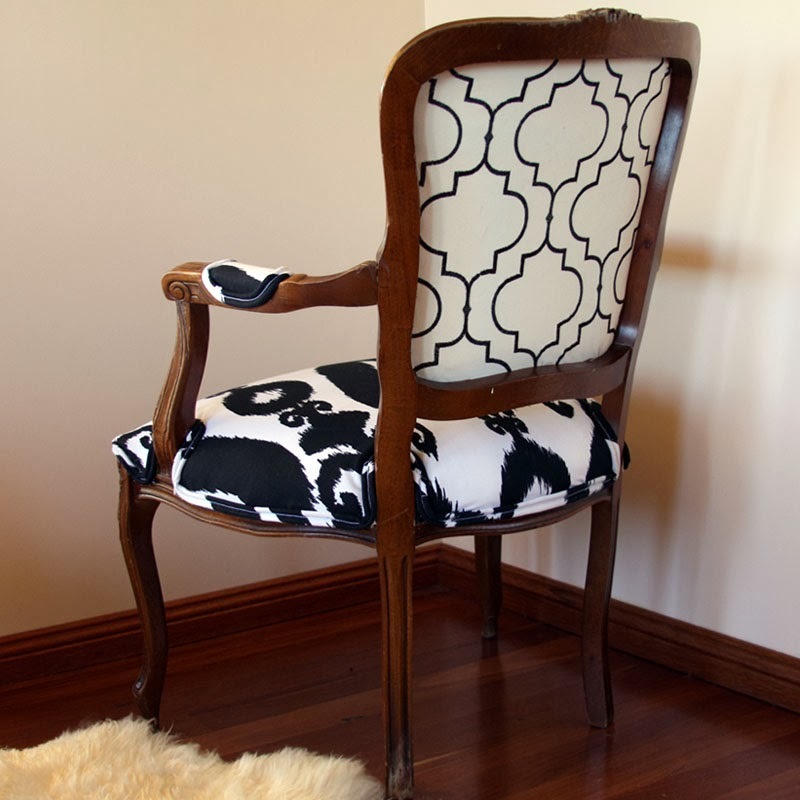 I decided on a black and white ikat fabric with a contrasting fabric on the back. Originally I was going to paint the chair frame black also, but as I lived with it, I liked the worn wooden look. It matches in with some of the cane furniture I have. The following shows the steps that I took with the project. Chair as it was when purchased. Except without the cat. The most important thing it when you are removing the old fabric, foam and layers to pay attention to where the staples were placed and in what order they went in. This will make putting it all back together again so much easier. Take photos if you can to refer to later or do a diagram. Whatever works for you. I don't have any pictures of removing the old fabric, unfortunately. I had to remove nail head trim (I levered that off with a screwdriver and a butter knife), then remove the fabric that was attached with very old upholstery tacks (levered a small portion of the fabric away to get leverage and then ripped it off, I was lucky the majority of the upholstery tacks were removed at this point). Any upholstery tacks that were left in the frame, I pried off with a knife (butter knife) and a screwdriver and some pliers. It took a while, I did it whilst watching TV. Once the fabric was removed I was able to see what bad shape the foam was in. At this stage I had to take it outside as the foam had turned to a sand like consistency and was getting everywhere. I laid down the original foam on a large piece of paper and drew an outline around it to get the correct size. I then took this to a foam supplier and had them cut a piece the same size as my template. If your foam wasn't deteriorating you could just take the original piece in to cut around. The springs and the webbing on my chair were in perfect condition so no changes were needed there. The next step is placing your new foam on the seat base. Hopefully your foam supplier trimmed it close to size otherwise you may have to trim it a little yourself. Once the foam is on the seat base, see where you will need to cut some notches in for the arms and back. Mark this with a marker and use a Stanley knife or kitchen knife to cut the notches out. This foam is easy to cut so go easily as it is easy to cut more foam off, more difficult to add it on. 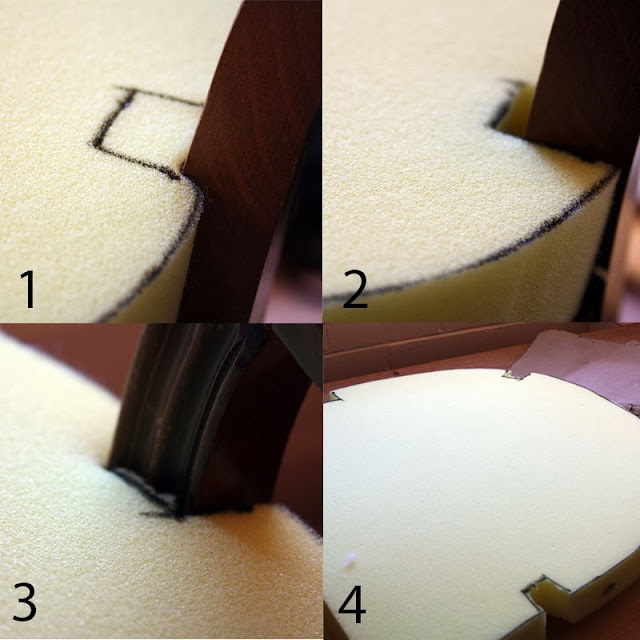 Once all the notches have been cut, place the foam back in place and make sure the foam sits where it should and make adjustment cuts if necessary. You can see where the foam needs to be indented to fit correctly. Once it is all the right size you want to start attaching the foam with a staple gun. I have an electric staple gun which works well for small projects (may invest in one that attaches to an air compressor in the future though!). You want to bring the upper edge of the foam down to the chair base and staple, supporting the foam and holding it down as you go along so it doesn't spring up again. It might look a bit messy and lumpy as you go, but these lumpy bits will be covered by the polyester fill. Make sure that when you are stapling, that you take care to staple in the same area as the foam was attached before. Once you have stapled the foam down, place the polyester fill on top and staple that down also. Try and staple close to where you fixed the foam. Once all stapled, go around and trim the wadding as close as you can to the staples (and it should look something like no.4). The next step, you want to make sure that you have the old piece of seat material you took off the chair. This will be used as a template to cut the new piece. One thing you want to make sure with a template is that if you are using a patterned material, that the template is lined up on the piece of the pattern you want (for example, I centred the ikat design on the seat base and back). Cut the fabric (always better to have more left over than have a too small piece). 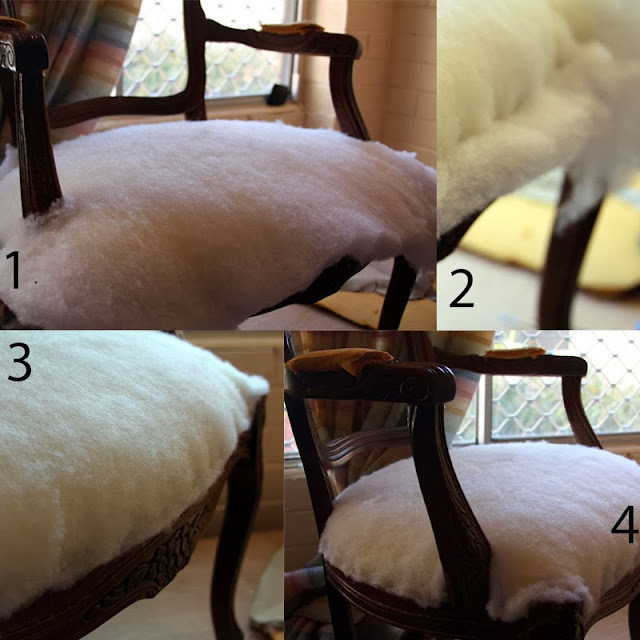 Place fabric on chair and ensure that it is centred. Put a staple in the centre of the chair base to secure the pattern where you want it, then do the same thing on the back so that it will remain lined up. Then on the seat front (from the centre out) staple whilst pulling the fabric securely and making sure that there is no slack. Centring the pattern and stapling. Once you have completed the front, do the back the same way. Then starting from once side, staple in a centre staple, go to the other side and place in a centre staple and then staple from the centre out on each side. When you come to the corners, it depends on the shape of the chair. I did a slight fold and then stapled. The parts around the base of the chair arms and the back are tricky. I cut two lines along where the fabric would go down either side of the arm and then reduced the bulk by chopping some of the middle. I just kept cutting and then checking, cutting and then checking. When the fabric folded down with little bulk, I stapled. I did the same with the back. Once all the staples were in place I cut off the extra fabric with a blade, I found it got closer than scissors. Cutting a notch to allow the material to fold around the back uprights. Then onto the back. It's a similar process to the seat. Stapling on the back fabric, trimming it. Placing the foam back where it originally was, then stapling on the forward facing fabric and trimming any excess. The arm cushions are pretty simple, use the original piece as a template, cut out two and staple in place. I had never heard of double welting until I looked into DIY upholstery. It's basically fancy piping to cover the staples. The double width is great at hiding uneven stapling. I totally didn't get double welting until I saw this tutorial. I think next time though I may use a block colour fabric as the white stitching isn't 100% fabulous. Measure around the arm pieces, the seat back and seat base to work out how much is needed. I measured about 5m so made 6m to be safe! 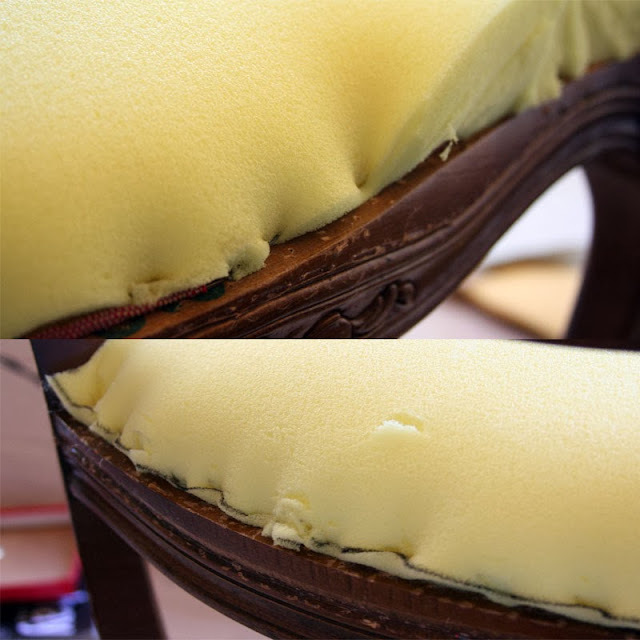 Once the welting is sewn, hot glue around the perimeter of the seat, back and arms. All in all, it probably took me 4 - 5 hours over a few days. I absolutely love it. I think I need to get rid of some chairs that I have to give me a chance to start some more!